Fukubukuro: it means 'fortune bag', and you don't know what you'll find inside. In Japan, many shops sell fukubukuro at the beginning of the year. People sometimes get in long queues to grab their hands on their favourite shops' fukubukuro. In some cases, they sell out in few minutes, as in the case of Muji. On Jan. 5th morning, I repeatedly called Avril headquarters to book my fukubukuro, but lines were busy. When I was starting to lose any hope, a gentle voice answered. When I first saw the box, I couldn't believe my eyes, it was soooo BIG! 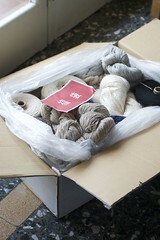 I think there are more than 5 kilograms of yarn inside. Some gorgeous silk mohair, about 500 grams of tweedy wool, two skeins of silk-cotton, a HUGE cone of silk, and several other cones... No top selling Avril yarn, but it was worth the 5000 yen I spent for all this stuff! What a wonderful idea! I wish American merchants would do something like that! Se lo facessero anche in Italia, sarei la prima a prenotarmi! Se il pacco porta fortuna in base al contenuto, avrai un anno meraviglioso!!! una volta in un fukubukuro ho trovato una pentola di terracotta!!! Anche io il buruburu o come diavolo!!! That's a lovely idea! And since most of these posts are in languages I don't understand.